One of the things that has concerned me since the fall in March was the damage done to my spine/hip. Apparently it (the damage) was significant and my body is not happy with me right now. The x-ray also revealed the extent of the damage to my hip from over use. Weaving on a floor loom with that awful side-step-depress motion to release the brake has taken it's toll. Once I had recovered from the initial fall - and everything seemed to be ok - I was still a bit suspicious about my hip and had discussed with Doug on several occasions about converting the Leclerc Fanny to a live weight tension system. After getting the results of the x-ray last week I realized that it was not something that could remain in the realm of theory and over the past couple of days Doug has been messing about with a cord and weights. The live weight tension system is really simplicity itself. So simple it seems like it shouldn't actually work. It took quite a bit of weight before I felt I had the correct amount of tension on the scarf warp, but it seems to be working just fine now. That's 25 pounds of lead on the heavy end, one pound on the other end of the cord. Of course, how I beam warps may have to change, but we didn't remove the old Leclerc brake system from the loom, just locked it 'off', so it will be easy to remove the cord and lock the brake on again for beaming the warp with the trapeze. I suspect more weight will be needed for cloth that requires a firmer beat than the rayon scarves I'm currently weaving, but Doug bought lots of weights of various sizes. And we know where to get more. Currently reading In Praise of Slow; how a worldwide movement is challenging the cult of speed by Carl Honore'. 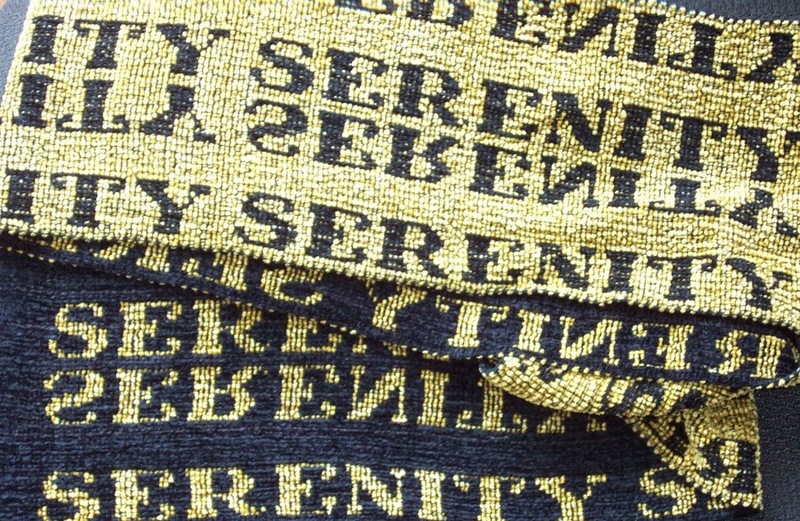 I saw a TED talk with him a while ago, and of course the Slow Movement has crept into the world of textiles. The thing that I noticed however, is that the Slow Movement is not solely about doing things slowly, but doing them at the correct speed. If you have ever watched a chef prepare food, you will have observed that they do not slice and dice slowly, but very efficiently. IOW, very quickly. 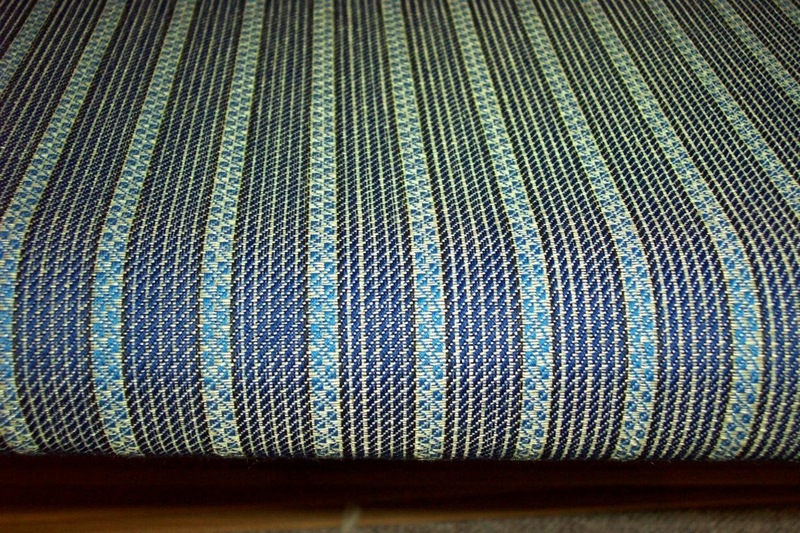 Handwoven cloth is by it's very definition 'slow'. That doesn't mean that I want to work slowly (even when my body demands it!) I want to work at a purposeful, efficient pace. I want to work at the 'proper' speed for whatever it is I'm making. Sometimes that means I go more slowly (ie. use a temple) in order to be more productive in the long run. The big thing about the Slow Movement is that it wants people to stop rushing. Rushing through their day. Rushing through their meetings, their meals, their interactions with other people. Stop rushing through their lives. Being Slow doesn't mean wasting time. It means using your time well, staying focused on what you are doing rather than always thinking about the next thing and the next and the next, forever not in the moment. A lesson more of us need to learn, I think. Remember this? Yes, it's still on the loom. However, I did manage to get to the loom yesterday - not a full session, but still - and since things didn't seem to be any worse today, have just now finished another session. But rather than leave the computer at the loom on, I shut it down so that I would not be tempted to try a second session today. I'm not quite back to 100% and don't want to stress my lower back/hip too much, too soon. What a relief to be able to weave again, even if I am clumsy after so long away from the loom. It doesn't take long for muscle tone to deteriorate! Today went a little more smoothly though, so I will aim to do one session tomorrow as well and see how things go. A while ago Interweave Press posted the Introduction to the wet finishing dvd to You Tube. For anyone interested, click on the link above. Interestingly, there is one 'dislike' - not sure why someone wouldn't like an introduction to an instructional dvd! Or maybe, they just didn't like moi. Who knows? I surely don't. Remember - if you like someone's product, whether that's on You Tube, Amazon, whatever, take a moment to 'like' or review it. As for The Efficient Weaver DVD - no word yet on when it will be ready. It should be coming out soon. I'm assuming summer and vacation time has slowed things down. Is the name of the shop in Vancouver for whom I wove the special 'spa' or beach towels. They are now available in their shop. More progress today - back is feeling yet again a tiny bit better and I finished the tow linen weft beige/orange towels. Now I have just a small pile of hemming left to do and hope to get it all caught up over the weekend. If - and it's a big if - I'm feeling better enough on Monday I will attempt to weave on the AVL for one session and see how it goes. 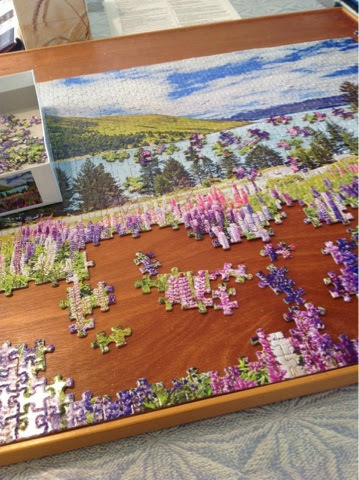 In the meantime, I have started another jig saw puzzle, and another book - Pure in Heart by Susan Hill. The days are getting very noticeably shorter. We are nearing the end of summer. I'm hoping winter doesn't arrive any time soon! However, I am getting better. I am able to sit more normally, which means I have been able to dig into the piles and piles of hemming. Still lots to do, but at least the mountain range has been reduced somewhat. One expert estimated a very long recovery. I'm hoping it won't take as long as all that, but continue to ignore the looms in the studio, making jig saw puzzles and hemming. It seems wise to give my body more time to heal before thinking about trying to sit at the loom. I have even read a little. The one I just finished was Crime in Corn Weather by Mary Meigs Atwater. Yes, our Atwater. In addition to her work with weaving, she also wrote a mystery. First published in the 1930's the book is a bit dated in the same manner as Christie and Sayers, but a bit daring for the times, I think. It is when I am too sick or injured to weave that I realize all over again that weaving isn't just what I do, it's the way I am. It's what I am. A thread bender. Creative. A do-er. What is so nasty about this particular episode is that I haven't even been able to sit to do other craft work (hemming, bobbin lace), read, or even write. So all my avenues of creativity have pretty much been impossible. I even, (gasp!) resorted to daytime tv, which I haven't done since, well, since recovering from the broken ankle. All that said, I am beginning to notice tiny (teeny, tiny) signs of improvement. I can actually sit for short (very short) periods of time - enough that I've managed to hem a few towels, half a hem at a time. I can now lie down on the bed (for a short time) to read. On Wednesday I'll find out the results of the x-ray and hopefully the doctor will have a treatment plan. In the meantime, it's been pretty much radio silence on the internet, partly because I haven't been able to sit at the computer, partly because I simply haven't been doing anything! Very grateful for all who have been in touch sending their best wishes. I'm really hoping it won't take too much longer before I'm back in weaving form. 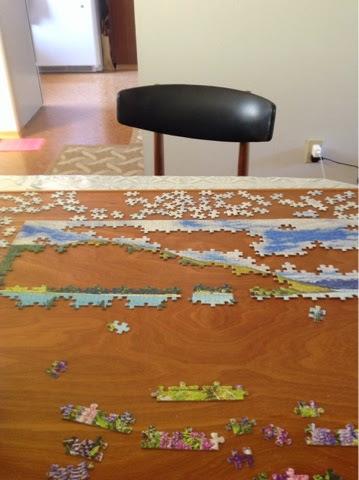 It's interesting how many weavers also enjoy making jig saw puzzles. I think it has something to do with the ways they are similar. They both involve a whole lot of process. Being sensitive to detail, colour and texture. Being willing to analyse, try to identify what needs to go where, even making mistakes and keeping on and on. Until done. 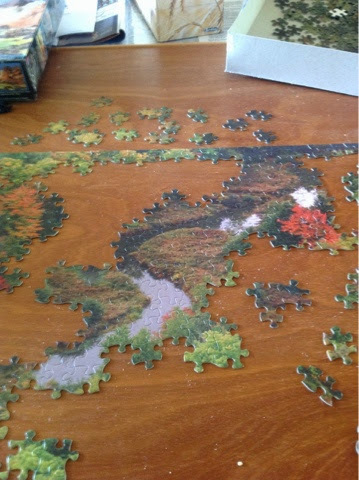 This puzzle isn't terribly difficult. I wasn't looking for any particular challenge, just something to occupy my mind and keep it off the fact (as much as possible) that weaving is not happening right now. And probably won't for some time. I don't know what sparked this most recent episode of physical 'fragility' but it is taking a very long time to clear up. Emotionally it has been very difficult to not be weaving. I joke that I'm addicted to weaving, but in its way it's not really a joke. As a friend observed sitting at the loom is my happy place. In many ways, it keeps me sane, or at least on an even emotional keel. Even though I'm anxious to get back to the loom, I think weaving was making things worse, so in order to get well more quickly, it appears I need to take a break. Just wish I could at least sit to do hemming because that mountain won't get smaller on its own! I am under orders to rest, so no weaving for a few days. Don't think this was quite what she had in mind, but it keeps me from going stir crazy. No one's life runs smoothly all the time. Certainly not mine. But this summer has seen more pot holes in my road than I have had to deal with for a while. Although I try to stay up beat and positive, chronic pain certainly does wear one down. Even though I am pretty open about stuff, even I have my limits about how much whining I will do. Let's just say it's been more of a challenge than I had the energy and optimism to deal with and the past few days I threw myself a bit of a pity party. After Complex Weavers I had made arrangements to visit with two more weaving friends, so that got cancelled along with the rest. And I was dreadfully disappointed about the whole trip not happening. And then last night I got an email from another weaving friend who was passing through town today. She had time for a short visit. So we made arrangements to meet at a coffee place and had a brief but very welcome time to catch up with each other. Recovery from an injury never proceeds in a straight line and today was worse than yesterday. However I'm hoping that an infusion of chemicals and only one session at the loom today will mean that tomorrow will be better. What can I say? I am an optimist. It feels better, according to the Dalai Lama. I can't begin to tell you how difficult the last 10 days has been. I'm no stranger to chronic pain, but the pain I was having was particularly cruel in that I could not sit or lay down without sharp pain. That meant I could not sleep properly - which meant Doug couldn't, either - nor could I do anything that required sitting - like tackle the hemming pile. I had the last statin tablet on Monday night and it has taken until today before I could sit with a modicum of comfort - and I use the term loosely. I still have inflammation in my right leg which makes walking difficult. I've been able to weave, partly because sitting perched on my tall stool, sitting high on the sitz bones, was relatively pain free. And because I have air assist on the treadle. The bad news is that the new pills my GP prescribed also have 'muscle pain' as an adverse effect. So does the alternate drug I had been considering taking. With so much inflammation in my leg tonight, I did not take the first dose of the new drug - rather I'm going to wait a couple more days. The beginning of improvement gives me hope this will all settle down now. By improvement, I mean I can actually sit without too much discomfort. I could eat my dinner. I could take a cup of tea. I could even tackle the hemming pile, although Doug brought the blue towels home today after pressing them, so the hemming mountain just grew another range! 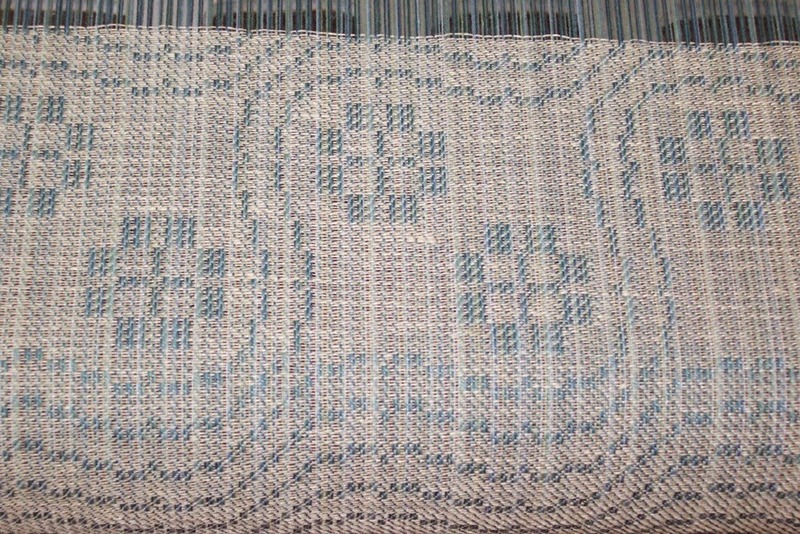 I have been managing to weave every day and today passed the half way mark on this warp - I think. I have sort of lost track. But ultimately it doesn't matter how much is done, how much is left to do. 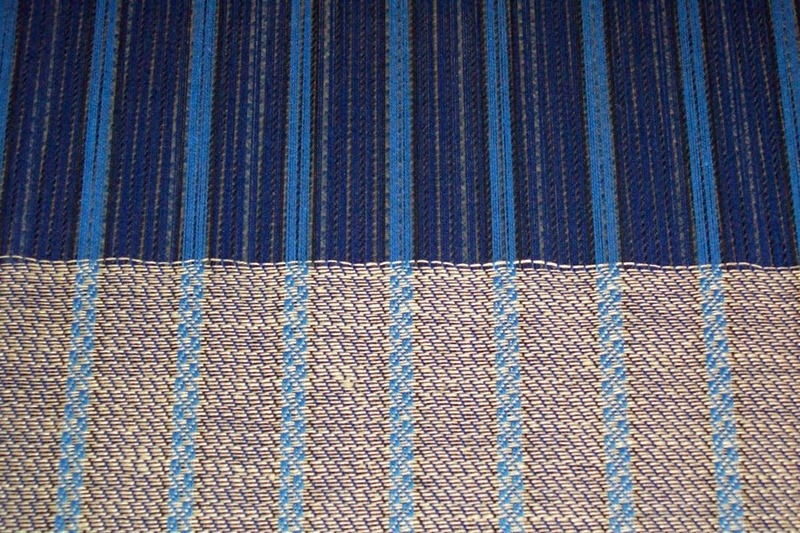 The cloth is looking good, the loom is currently behaving. I can still weave. The past week hasn't been great for a couple of reasons but today is looking up. 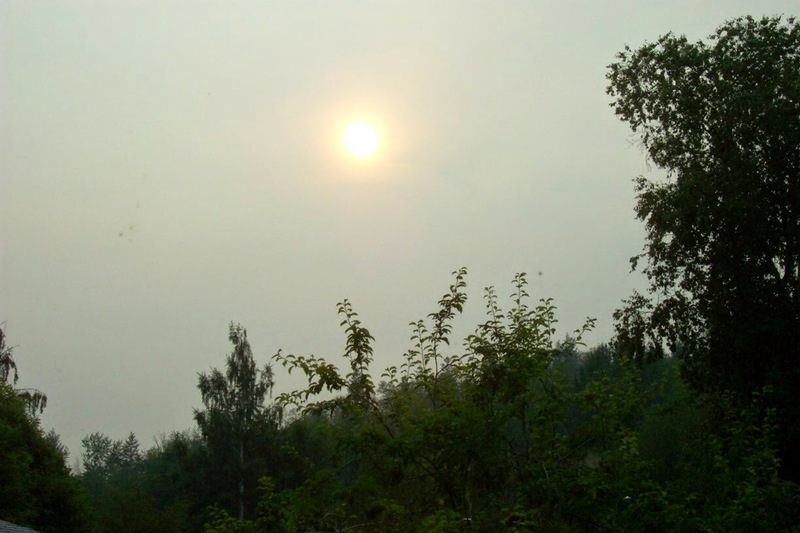 The smoke from the wild fires has cleared and we have lovely blue skies with predicted temps in the 70's F. And after trying statins at the urging of the specialist, suffering with extreme muscle pain for the last week, my new GP said I could go off them. I'm quite sure the fact that he has also experienced statin muscle pain was a large factor in his agreeing I could quit. He has started me on a 'new' cholesterol drug - or I will in a couple of days when the statins have been cleared out of my system. 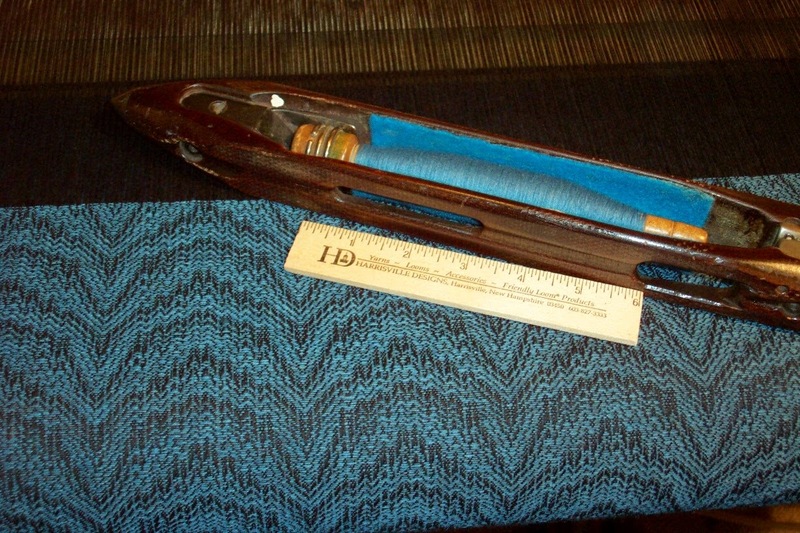 Since I hurt no matter what I did, what I did was finish weaving the blue warp and immediately beam the next. Yesterday it was threaded, sleyed and tied on and this morning I started weaving. These photos don't really do the cloth justice, but will give you an idea. The design is Wandering Vine or Snail's Trails and Cat's Paws but woven in twill blocks instead of overshot. Now that I've twigged how to easily convert overshot patterns into twill block designs, I may explore that a bit more. I like the large graphic nature of the the overshot translated into twill blocks. 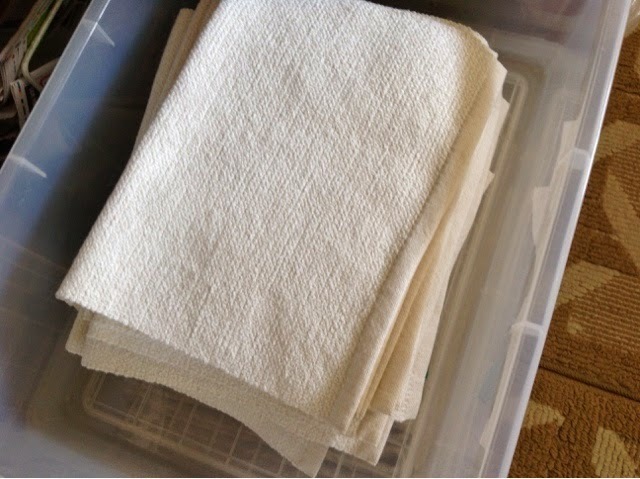 And I've still got all this very fine linen to use up as weft! Thing is, when you live in the forest, sometimes it burns. This photo was taken about 4 pm. Instead of a clear blue sky, we have a thick haze of smoke. Point of fact is, we aren't the worst off - it seems the western side of the continent is going up in flames as well as the far north and some areas are far, far worse. With the Farmer's Almanac predicting a hotter, dryer summer than 'normal', we can expect the wildfires to continue. Just in BC alone the province has way too many significant fires. The land all round is rough making getting to some of these fires next to impossible. Fire crews are run off their feet trying to contain (not necessarily put them out, but keep them from spreading) which means that smoke is going to continue to be a problem even though my town isn't in immediate danger from the flames themselves. Some towns are. Weaving with the fewest shafts up means I'm weaving the cloth with the 'back' side facing me. 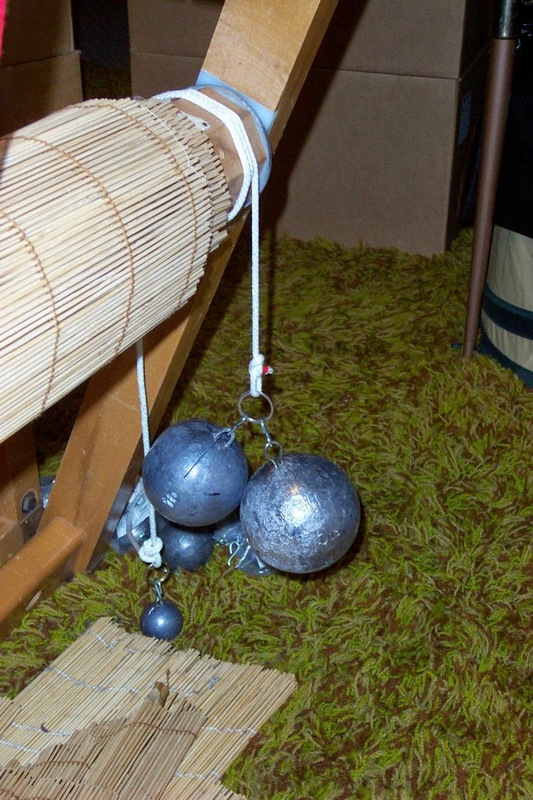 If you have an 'ordinary' treadle jack loom, the fewer shafts being lifted, the less effort required to do the lifting. It's a habit I got into when I first got the loom and even though I now have air assist on the treadle, I still set up my warps to lift the fewest number of shafts when ever possible. 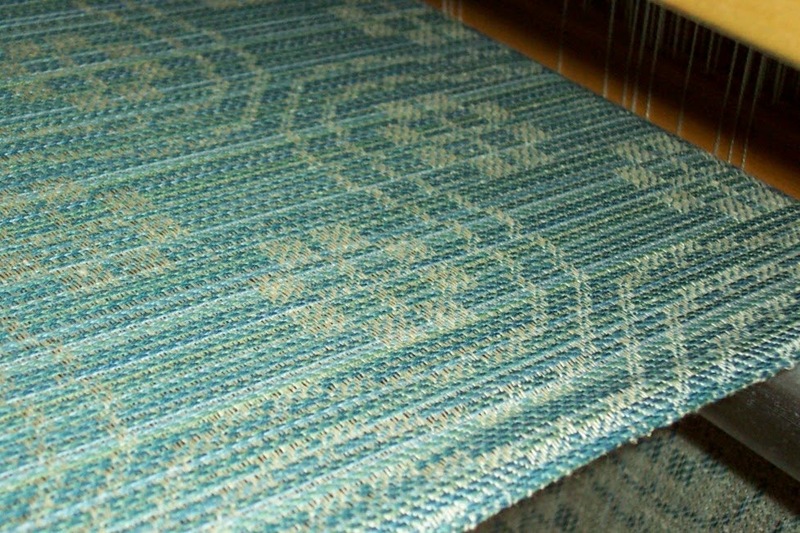 There is a subtlety involved in weaving that isn't well known but shows up quite clearly with this warp. Notice anything...odd...about the fell in the picture below? Yes, indeed, the last pick isn't in proper alignment. Is this a problem? Actually, no. Because in point of fact, the pick will be set into place by the next pick woven. This isn't usually seen but I've spoken to other experienced weavers and the observation is that the beater just presses the pick into rough alignment and it is the weaving of the next pick that seats each pick properly in the cloth. Since linen is stiff and wire-y, plus the weave structure is mostly a 1:3 twill, the tendency for the pick to pop up and away from the pick below is much more noticeable. A second beat is not required, just a slow steady consistent laying in of each and every pick. Subsequent picks press the pick below into place.